Boulder-based â80s cover band The Goonies will play a free live show Thursday, July 7, at Eagle Town Park as part of the Bonfire Brewing ShowDown Town Free Concert Series. All shows start at 6:30 p.m. in Eagle Town Park. • July 7 — The Goonies: Boulder-based four-piece ’80s rock band that never says die. • July 14 — Tauk: Cerebral funk created from the collision of hip-hop, rock and jazz. • July 21 — Tracksuit Wedding: Soulful vintage rock with elements of funk and blues. • July 28 — Dave Jordan: New Orleans-based singer-songwriter. • Aug. 4 — Sound Travels: High-velocity improvisational five-piece pop rock. • Aug. 11 — John “JoJo” Herman: Keyboardist known from Widespread Panic. 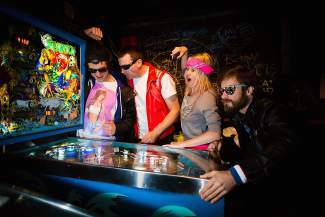 EAGLE — Gear up, dress up, dust off your roller skates and turn up your Walkman: Boulder-based ’80s cover band The Goonies are coming to town tomorrow as part of the Bonfire Brewing ShowDown Town Free Concert Series. This summer’s concerts will feature Eagle-based Bonfire Brewing Co. as the official beer partner. The brewery will offer an on-site public beer garden, along with post-concert taproom specials. Pack a picnic or visit one of the food vendors that will be located throughout the park during each concert and take advantage of kids’ activities. Bonfire Brewing’s ShowDown Town Free Concert Series, which runs through Aug. 11, features artists of varying genres from all over the United States, such as New York-based rock fusion group TAUK (July 14) and John “JoJo” Herman, of Widespread Panic (Aug. 11). For more information on the Vail Valley Foundation’s free concert series, like Vail Free Concerts on Facebook and visit http://www.vvf.org.